Two-year-old Robert Ashton died this date, March 29th, in 1852 and was buried at Bethel Burying Ground. 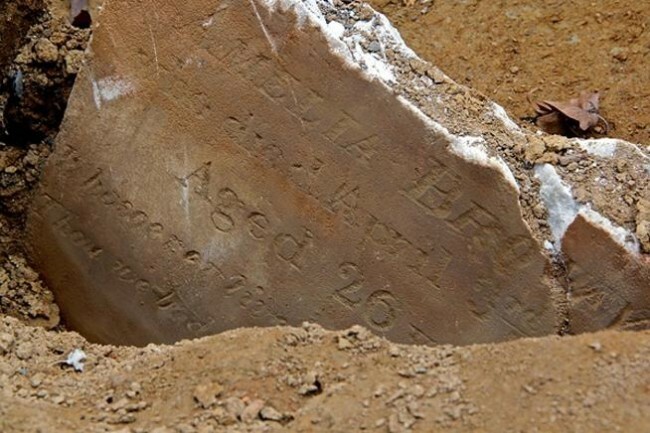 Two-year-old Robert Ashton died this date, March 29th, in 1852 of an unknown disease that infected his brain and lungs and was buried at Bethel Burying Ground. Little Robert’s parents John (47) Catharine (44) also had four other children: Catharine (9), Maria (7), Henry (5) and Robert (2) according to the 1850 Federal Census. John worked as a waiter making $15 a month or about $375 according to the 1847 African American Census. The Ashton family lived at 9 Ronaldson Street that runs from South to Bainbridge Streets between 9th and 10th Streets. The house sat up the street from the large Ronaldson Cemetery. The arrow indicates the approximate location of the Ashton home. It consisted of one room for which they paid $5 ($125) a month. Ronaldson Street was also home to the father of the Underground Railroad William Still so the street likely saw a good deal of recently liberated African and African American on the run. Ronaldson was also the home to Reverend Benjamin Templeton, pastor of the Second African Presbyterian Church and at one time to the offices of The Christian Recorder. Sadly, the Ashtons would lose their 11-year-old Robert, Jr. to a wasting disease the very next day. His biographical sketch is also on this website. The brothers are buried together at Bethel Burying Ground.